Rockford Public Schools, MI — As West Michigan increasingly goes global, so do Kent County schools. Ten Chinese high school students are taking classes here this school year, five each in Rockford and Kentwood Public Schools. They are part of what educators hope is a long-term partnership with the Weiming Education Group, an association of private schools in China. The pilot program emerged from talks last year between leaders of Weiming, Kent and Ottawa county school districts and Kent ISD, as a way to help prepare U.S. students for the global economy and cross-cultural communication. Having studied English since elementary school, the Chinese students are immersing themselves in college-prep classes and American culture. Football games and trips to Lake Michigan with their host families relieve the pressures of keeping up with calculus and their classmates' vocabulary. Several teachers from Weiming are also participating in the pilot , and help the students deal with their new surroundings. the seniors who return will earn diplomas from Rockford or Kentwood. Here's a snapshot of how students are doing so far. 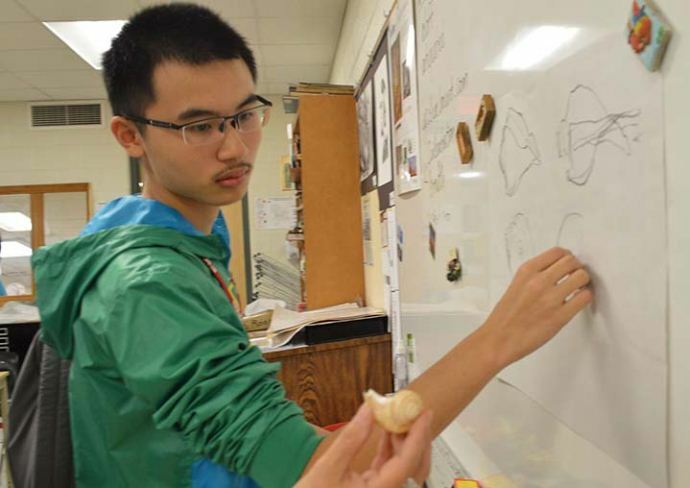 East Kentwood High School art teacher Le Tran offered Chinese student Harry Liu advice on drawing techniques, and Harry quickly got to work sketching a seashell. "He's a great student. I love having him here," she said. During the first week of school, Tran told Harry a project needed some more work, expecting him to continue it during class periods. The very next morning he turned it in, completed and perfect, she said. "He isn't afraid of hard work at all," she said. 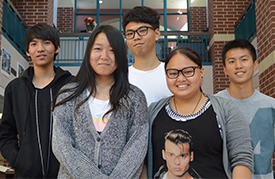 For the five students from the Weiming Education Group enrolled at East Kentwood, hard work is a way of life. Their school schedules in Shenzhen and Chong Qing are from 8 a.m. to 6 p.m., with a two-hour break for lunch. Formal studying continues from 7 to 9 p.m. While at East Kentwood, they are taking a regular slate of courses and living with local families. Teachers Melody Wang and Shelly Ye, also from the Weiming Group, are accompanying them to observe teaching practices and support the students. They plan to share what they learn with colleagues when they return to China, along with Yingying Tang, who accompanied the Rockford students. They have rented an apartment in the area. The students -- Krystal Liu, Harry Liu, Bill Liu, Victoria Xu and Jean Wu -- said they are getting used to their 11th grade courses and life in the United States, with encouragement from their host families, teachers and peers. Students appointed as ambassadors show them around, and Principal John Keenoy reminds them to use their English skills as much as they can. "I think the people are very kind," said Bill, who, like the other students, has adopted an American name. "They are helpful." Keenoy was among a group of administrators, including retired Superintendent Scott Palczewski, who traveled to China in April to visit schools and interview students interested in studying at East Kentwood. A goal of the partnership is for East Kentwood students to attend Weiming Group schools in China, probably for two- to three-week visits, in the near future. Keenoy said he is hopeful Chinese students will return next year after going home for the summer. "It's been a very positive experience for our East Kentwood students," he said. "The new students are doing great. We really enjoy having them here." The Chinese students said new experiences have included tasting American food and learning about American pastimes. Kentwood is a diverse community, with nearly 70 languages represented among high-school students. "I can communicate with American people easier than before," Bill said. Students said they really like "American football" and watching the Falcons in action. They have also visited Michigan's Adventure, the Grand Rapids Public Museum and the city of Saugatuck. Senior Alyssa Zokoe and her parents, John and Paula Zokoe, are serving as the host family for Victoria. A recent family camping trip was an adventure for her that included tents and s'mores. "It's sort-of a fun challenge helping her adjust to high school life," Alyssa said. "Something normal to us might be a culture shock to her." But similar tastes in clothes and shared love for the mall have provided bonding experiences, she said. While Victoria practices her English, Alyssa is trying to learn Chinese, a language where intonations matter as much as words. At Rockford High School, catching up with spoken English is a challenge for the Chinese students, despite their years of study at the Guangzhou Experimental School. So is communicating to teachers and students, says Yingying Tang, a teacher from China accompanying the students. "They will be afraid other people don't understand," she said. "But I think they will enjoy the year here. The teachers here are giving them a lot of help." Zany Zou, a senior, admits keeping up with the language is harder than she expected. She's finding it easier to read English than to hear it. "They speak very fast," said Zany, sporting a Johnny Depp T-shirt. But she said she's enjoying biology and history, and had a ball at her first football game. Like most of her fellow Chinese students – Misy Shi, Irving Zheng, Danny Chan and Chris Chen -- Zany plans to attend college in the U.S. That was a strong motivation for coming here, they say. "The final goal for us to come here is to better prepare for a good university," said Chris, who aims to be a doctor. "If you have a chance to get into a good high school, then you have a chance to get into a good university." Despite the language challenge, he added, "If we are brave to ask questions, this won't be a difficult problem for us to study here." Danny Chan finds a lot to like about schooling American-style: the wider choice of sports, the shorter school day and the greater use of learning activities for students in the classroom. He figures it all will help get him ready for college. 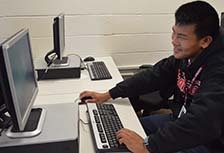 "In America, I can learn more skills – some partnership or leadership," said Danny, who's interested in math and economics. "I can have more fun when I'm learning here." His two complaints: lunch is too short and the runs in gym class too long. "It's not too long," Chris chided him. Jared Kish, a fourth-year Chinese language student whose family is hosting Danny, says he likes learning from and hanging with Danny and his friends. "These guys are great," Jared said. "We get together and go play basketball. We have fun." Jeff Hayes, Rockford's Chinese teacher and Weiming program coordinator, loves to see that kind of social interaction among the students. He hopes to see the program grow to 15 or 20 Chinese students and, eventually, Rockford students in China. "The United States and China need to understand one another," Hayes said. "What better place to start than with our young people?"